Looking for a challenge for 2019? Why not join CASA for a Skydive on either the 8th of June or the 14th of September 2019 in the Irish Parachute Club in Edenderry. Not only will you be having an amazing experience but you will be supporting CASA at the same time. All you have to do is raise a minimum of €520 and keep your nerves under control!!! CASA is now taking names of participants so sign up quick before all the places are gone. Feeling adventurous this year? 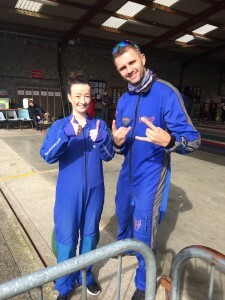 Why not join CASA for a Skydive on 14th September 2019 in the Irish Parachute Club in Edenderry. Not only will you be having an amazing experience but you will be supporting CASA at the same time. All you have to do is raise a minimum of €520 and keep your nerves under control!!! CASA is now taking names of participants so sign up quick before all the places are gone.